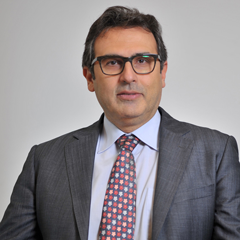 Mr. Alain A. Bifani is currently Director General of the Ministry of Finance in Lebanon. He is also member of the Central Bank (Banque du Liban) Central Council, Member of the Higher Court of Banks, Member of the Open Market Committee (OMC), President of the National Social Security Fund’s Financial Committee, Alternate Governor, International Bank for Reconstruction and Development (World Bank), Lebanon’s Deputy Governor for the Arab Fund for Economic & Social Development and the Arab Bank for Agricultural Development. Mr. Bifani has also held several leading and key roles in various national and international organizations, including a board member of the International Monetary Fund (Alternate Governor for the MENA region); Member of the Experts’ Panel in the International Monetary Fund; Chairman of the Group of 24; Consultant at the United Nations Development Program (Lebanon); Director at Thomson Financial Bankwatch; Founder and President of Pitch sal (Lebanon); along with key roles at ABN AMRO Bank (Lebanon / Dubai) and Arthur Andersen (France). Since 2011 Mr. Bifani is working towards a Ph.D. in Economics at the University of Paris La Sorbonne, France. He is a graduate in Finance from the Ecole Des Haute Etudes Commerciales in Paris, and has an Engineering degree in Optics, electromagnetism, and telecommunications from the Ecole Superieure d’Optique in Paris. He has chaired and participated in many high-level committees and organizations. He is also an economics editorial expert, and author of many studies in economics and finance.